The Corvette Racing team was all set for a 1-2 GTLM class win at today’s WeatherTech Sports Car Championship race until the No. 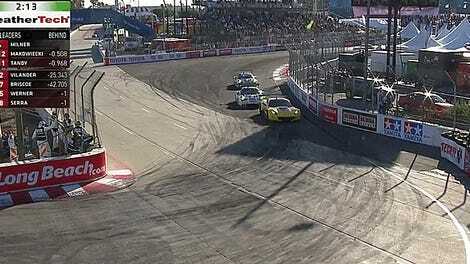 3 Corvette got stuck behind a three-car pile-up on the exit of Long Beach’s final hairpin. Is there anything worse than watching everyone pass you while you’re stuck behind a crash? 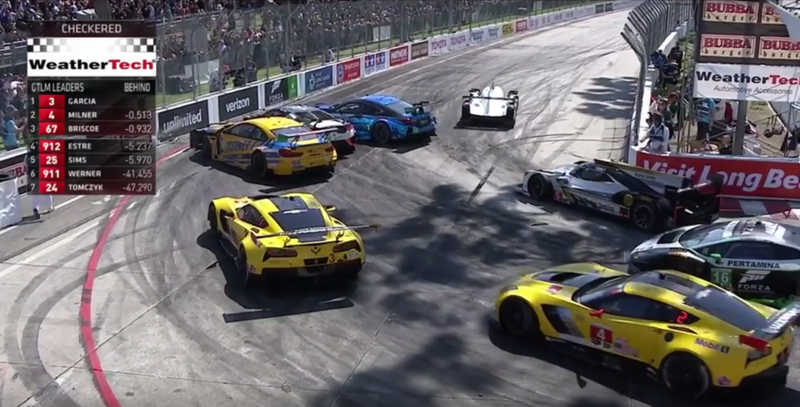 The hairpin, which already caused one big traffic jam earlier in the race, was the final corner the Corvettes had to navigate before sailing home to the top two steps of the podium. The No. 15 Lexus RCF of Robert Alon tried to dive down the inside of the No. 86 Acura NSX at the hairpin, pushing that car into the No. 96 BMW M6, resulting in all three cars whacking the wall on the outside of the hairpin. The Corvettes went side-by-side to block the No. 67 Ford GT right behind them as they approached the on-track traffic jam caused by the three-car pile-up, but the leading No. 3 of Antonio Garcia took the wider line through the turn. As a result, the No. 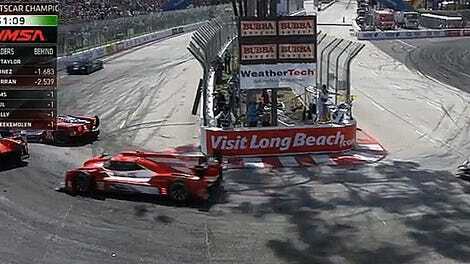 3 got stuck behind the three crashed cars as race traffic flowed through the open inside line. Tommy Milner in the No. 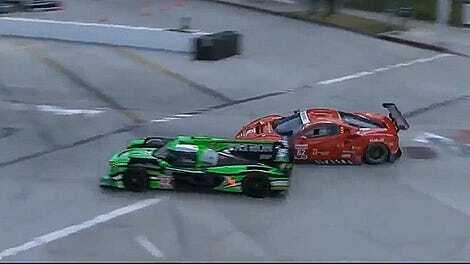 4, who was robbed of a win at the hairpin himself last year, at was able to keep the lead for Corvette Racing as it snuck through the open hole to cross the finish line in first place, but the No. 3 was still stuck. Garcia had to wait for all of that clogged traffic to pass before he could bring the No. 3 across the finish line. It’s absolutely heartbreaking to watch a guy lose an almost (key word: almost!) guaranteed win like that. The No. 10 Wayne Taylor Racing Cadillac DPi-V.R Prototype won overall, making this that team’s third overall and Prototype class win win in a row. The No. 50 Riley Motorsports-WeatherTech Racing Mercedes won the GTD class, because yo dawg, I heard you like WeatherTech or something. UPDATE (4/11): In addition to spawning a completely nuts Twitter spat between Driver Not Appearing In This Pile-up Sean Rayhall and Alon’s Lexus teammate and frequently shirtless man Sage Karam (who came to Alon’s defense and has since deleted his tweets), IMSA announced this morning that Alon has been placed on probation for taking an unjustifiable risk at this turn. What Was This Porsche Racer Thinking?